Figure 1 The CCD array layout. The two Fields of View from both telescopes are mapped onto the array, with the imaged objects crossing the focal plane in the +yfpa direction at a constant speed of 60" s-1. Every object crossing the focal plane is first detected either by SM1 or SM2. These record respectively the objects only from telescope 1 or 2. This is achieved by a mask that is placed in each telescope intermediate image in the across scan direction (parallel to the detector column). Next, a surrounding window is allocated to the object and is propagated through the following CCDs of the row as the imaged object crosses the focal plane. The object is confirmed by the detectors in the first column of the Astrometric Field (AF1) for eliminating false detections (cosmic rays). The object then progressively crosses the 8 next AF columns, followed by the BP, RP and RVS detectors. The spacecraft's accurate attitude control provides the position of the imaged object versus time, which is used for operating the detectors along the line in windowing mode. This reduces the readout noise to a few electrons. The nominal integration time per CCD is 4.42 seconds, corresponding to 4500 pixels along scan. For bright saturating objects, the integration time in AF1-AF9, BP and RP is reduced by activating electronic TDI gates in the detector over a short period corresponding to the bright star window. The purpose of the TDI gates is to lower the effective number of pixels along scan. Twelve gates are available in the detector and allow optimising the signal collection for bright stars at the minimum expense for faint stars. All CCDs have the same format and are derived from e2v Technologies design and are large-area, back-illuminated, full-frame devices. They are operated in Time Delay Integration (TDI) mode with a TDI period of 982.8 μs. The focal plane is passively cooled to 170 K for reducing its sensitivity to radiation. The box shaped CCD radiator provides the radiative surface with the colder internal payload cavity (120K) as well as CCD shielding against radiation and support for the photometer prisms. 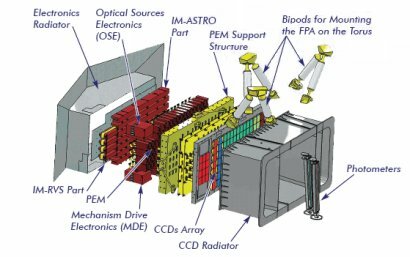 Figure 2 The focal plane assembly, with the CCD array. Light from the telescopes comes from the right in this view. The electronics radiator on the left marks the outside of the spacecraft.